As a graphic designer in the real life, I’m absolutely delighted to kick off a new category of articles on WatchPaper, called “Masters of design”. 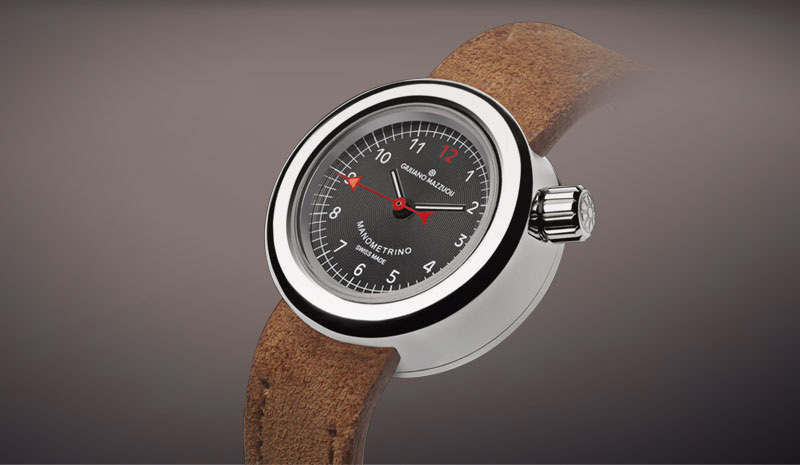 In this category, we’re going to feature watch designers that marked (or that we think will mark) the history of industrial design. My excitement is further heightened by deep admiration I have for the work of Florentine designer, Giuliano Mazzuoli. As we will discover together his creations trough this article, you will understand why we chose to include him into this category. I laid out, reproduced, and printed every kind of material, but in particular I printed catalogs for objects of poor taste and some of great design. This is what made me want to print something that I designed. I started with an object that was close to my activity at the time, an agenda. It was a simple diary designed according to my own needs. Organizers were too complicated and too “organized.” I dedicated to the year 2000 a limited edition agenda book that was different than what was ever done before. 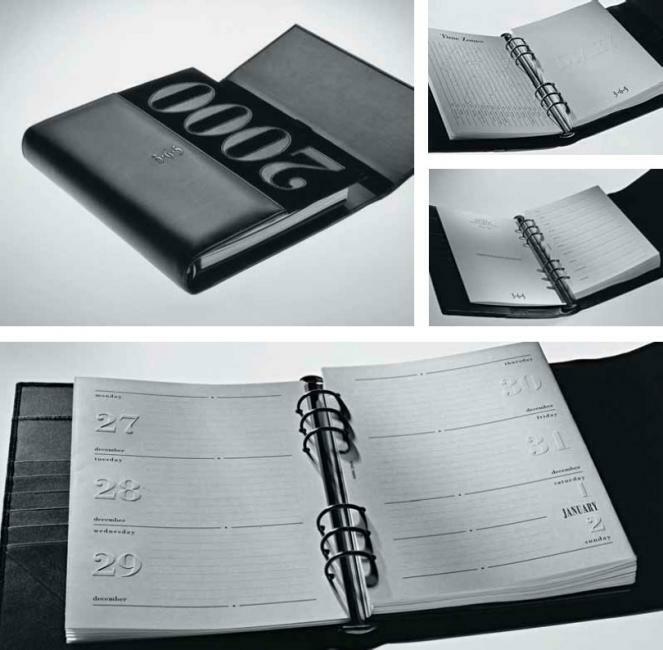 Limited edition agenda with dry debossed pages. A small modification allowed the debossing to not effect the previous page or the subsequent one. A print run of about 500,000 copies of a series of notebooks that made the world smile that had lines in the form of waves. 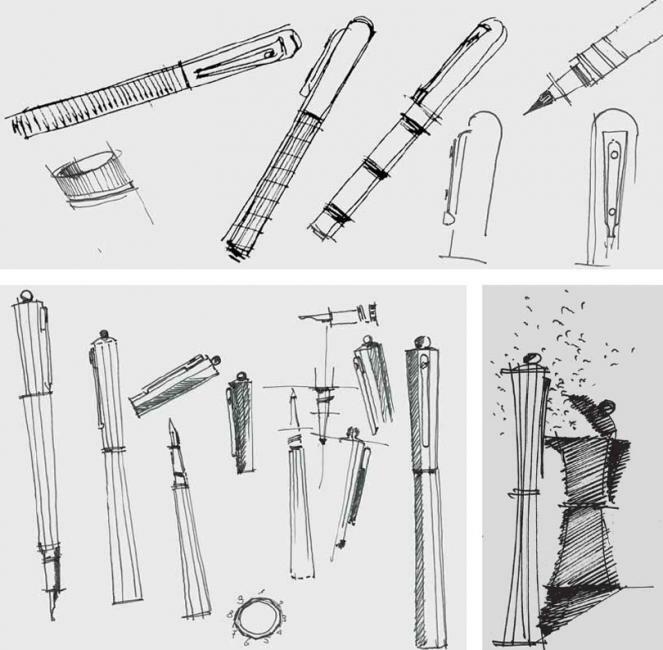 As industrial designer he started out with two lines of pens, one inspired by workshop tools, the other by the famous coffee machine that he name Mokina. Giuliano Mazzuoli’s first watch, the Manometro. It’s also his best seller. 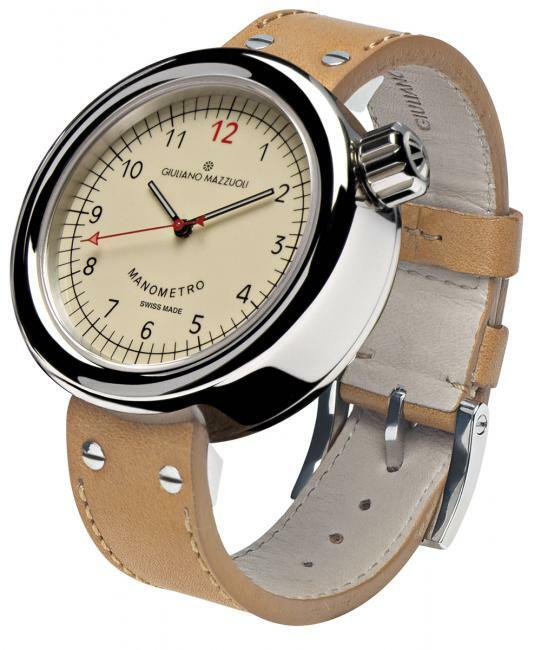 Following the success of the Manometro, Mazzuoli designs the unisex Manometrino, with a smaller diameter (27mm), it is dedicated to all the people, especially women that were interested by the Manometro, despite its large dimensions. 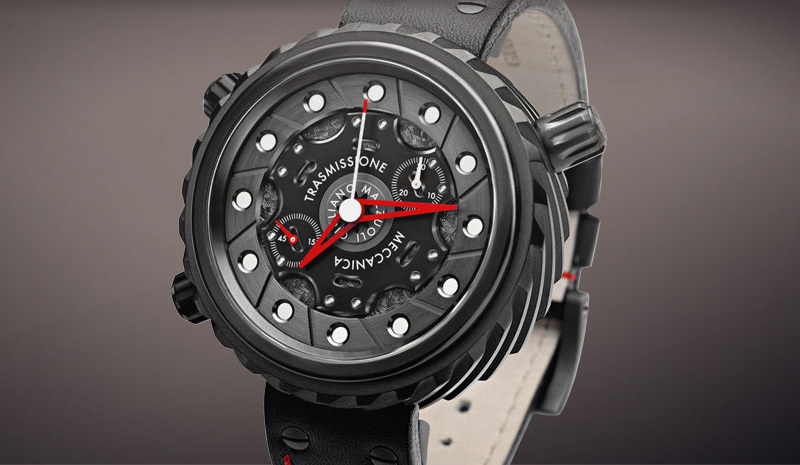 The unisex Manometrino has all the qualities of the Manometro in a smaller size. There was a time when I used to watch the gear box being taken apart and put back together with anticipation so that I could take a ride in the car. Today, I look at it in a different way. 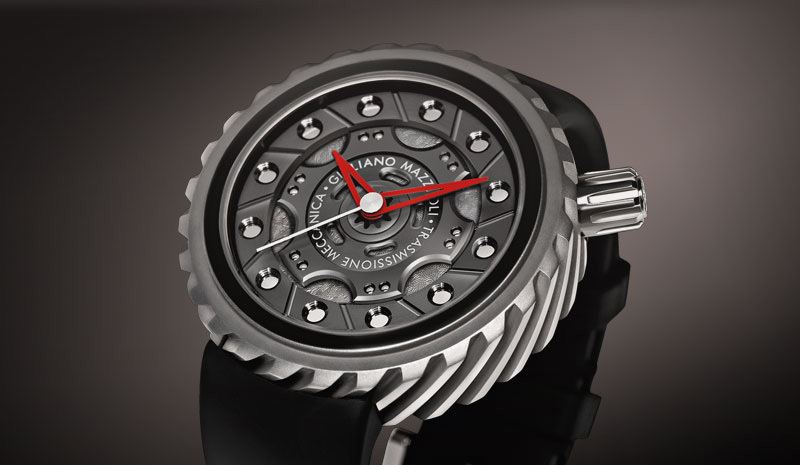 I am inspired by mechanical parts and transform them into a timepiece. The gear became the case of the watch. 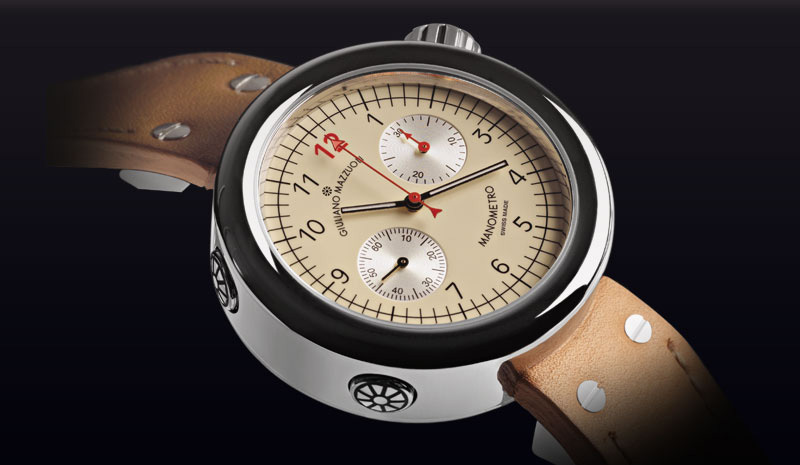 I transformed the disc of the clutch into an original dial while the crown of the watch is identical to the spline shaft (Tuscan mechanics call it “sedano” – “the celery stick”) that transmits the rotations of the engine to the gear shift. 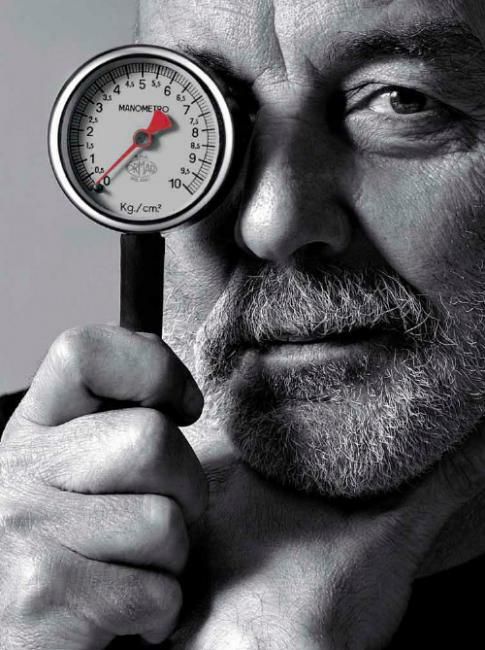 The hands of the watch are like the ones on the compass found on the mechanic’s bench. Finally, here is my favourite, the Contagiry (tachometer in Italian). If the Manometro has a simple and clean design, the Contagiry takes this principle even further, by removing completely the crown. It has a lever similar to a “gear shift” and through the lunette of the watch you can carry out the functions usually done through the crown. 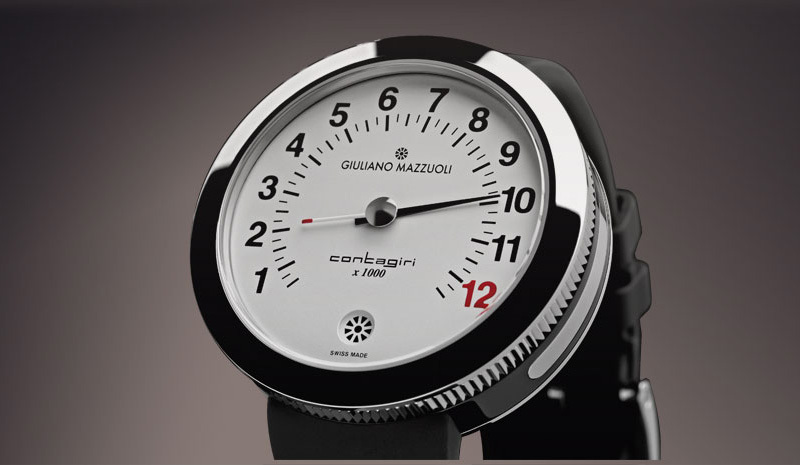 I think that these watches should be part of the collection of any serious fan of Italian design. They’re good representations of the very essence of contemporary Italian design and I’m sure we’ll see them in museums and design exhibition catalogs.